TECO is a global convention in which global steel companies share their current status of technology development and discuss the current issues that the steel industry is facing. 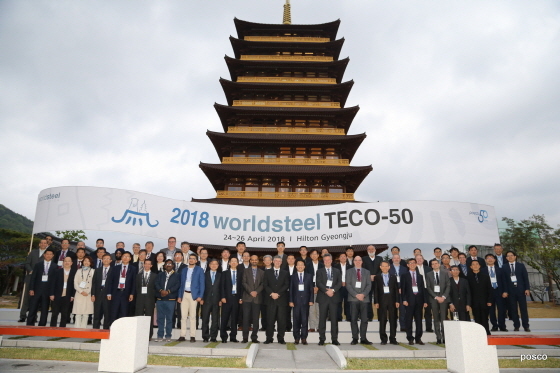 POSCO hosted the 50th TECO for a second time following its first hosting of TECO back in 2010, to celebrate its 50th anniversary this year. At this convention, more than 60 experts from steel and related industries such as ArcelorMittal, NSSMC, Tata Steel and Voestalpine and also Secretary-General of the World Steel Association joined to shine the conventions. This convention held in Gyeongju, South Korea from April 23rd to April 26th. Since sustainability has become main global issue, the main focus of the convention was carbon dioxide emissions and energy. The participants in the convention expressed their own perspectives related to the development of iron and steel manufacturing, rolling process technology and development of innovative products and digitalization that lead positive impacts on environment. POSCO’s own technology that may shine in the convention is ‘high-manganese product and manufacturing technology that is invented first in the world. This unique technology was one of the driving forces of POSCO become world leading company. Additionally, participants had a great opportunity to experience Pohang Steel Works, the FINEX plant, smart factory and rolling system and then visit POSTECH to see world’s 3rd 4G synchrotron accelerator. * 4G synchrotron accelerator: ‘Ultra-high-performance gigantic microscope’ that observes the microscopic structures and reaction of materials using synchrotron radiation when accelerating electrons at the speed of light. The World Steel Association, founded in 1967, is the most authoritative organization in the steel industry, which promotes the understanding and interests of the steel industry. Currently, as many as 170 steel companies, related associations and laboratories around the world are listed as members. The World Steel Association and the Technology Committee shares the technologies developed by individual steel companies in every year to propose joint research on steel technology and encouragement of cooperation.